In this chapter, I will mainly focus on how nibs made from such significantly different materials like stainless steel and gold can perform similarly. From the chapter Material Technology, we have learned how materials are assessed and characterised and noticed the significant difference between stainless steel and gold. In the chapter Nib Mechanics, we became familiar with the nib’s performance, its function and what the fundamental criteria in mechanical physics are. Let us first go back to Material Technology, refresh your mind about elasticity and pre-stress. Pre-stress is a load inside the material. Generally, components do not show the load/stress they are under, like a coil spring with its windings close together. Its windings only separate after the force applied is larger than the pre-load. In diagram 1 you can follow this when you look at the orange line. 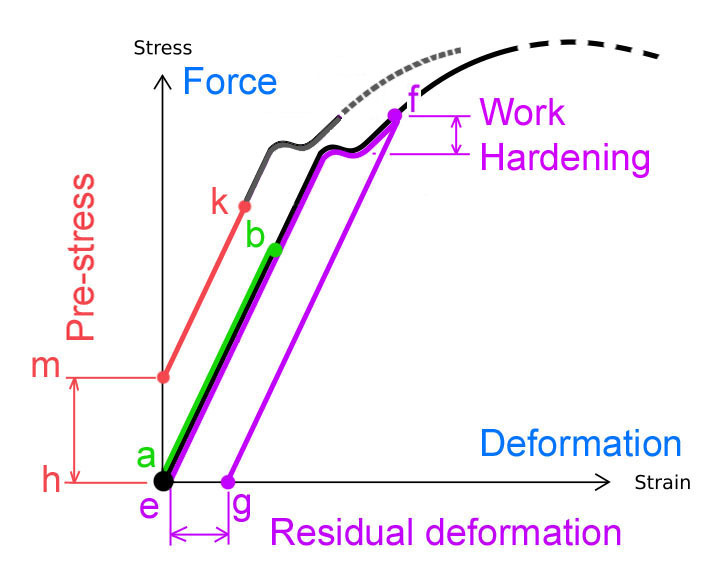 Along the vertical, the force axis, there is a distance marked h – m. This is the pre-stress or its equivalent pre-load. It needs to be overcome before the component deforms and its change in shape is shown along the horizontal, the deformation or strain axis. 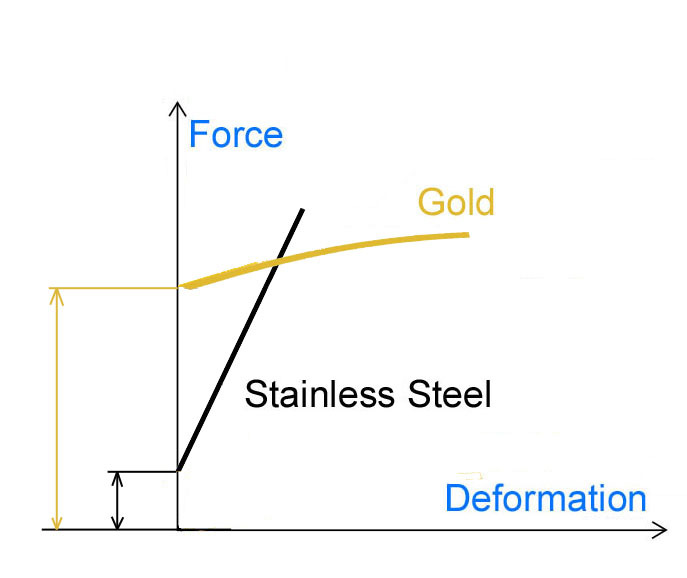 Applying more force and removing it makes the deformation move up and down, along the curve and as long as the deformation moves only up to point k for example, meaning: it stays below the yield area, the deformation will be elastic. After the load is taken off, we return to point m, and the pre-load remains unchanged. When the force applied moves the deformation in or beyond the yield area, the pre-load will be reduced. Applying the above to the nib: In a nib, the pre-load is applied to the tines at the end of the manufacturing process, during the setting. If the nib is only slightly mistreated, the load has passed into or beyond the yield area, the tines will still close, however, since the pre-load has been reduced the writing characteristics will have changed. After the described treatment the tines will separate at a lower level of writing pressure, or said differently: the tines will separate more easily. The response to writing pressure of the tines will increase. After the described treatment the tines will separate at a lower level of writing pressure, or said differently: the tines will separate more easily. The response to writing pressure of the tines will increase. When the setting of the nib is done manually, the above procedure will be applied by the setter to adjust the pre-load force, so that the nib performs comfortably. I would strongly recommend leaving this job to an expert. Reducing the pre-load is easy; increasing a bit more tricky. 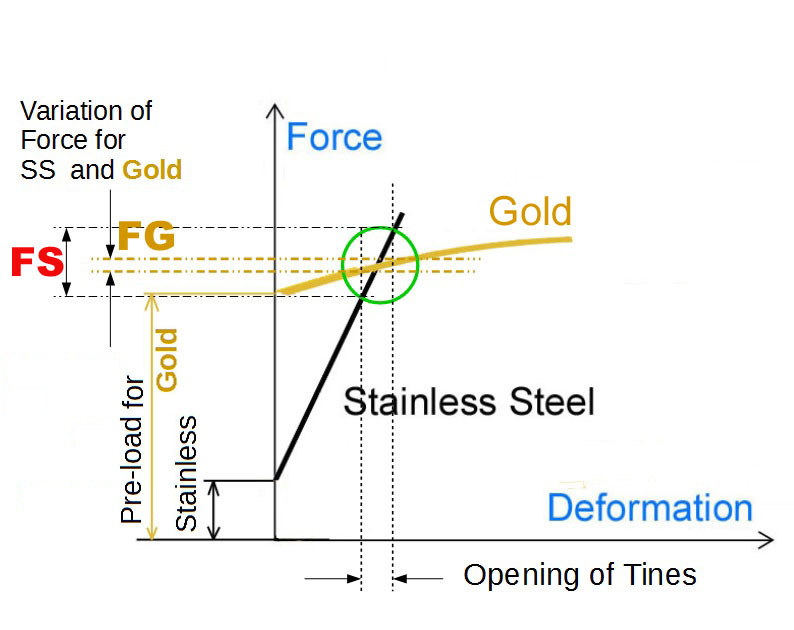 We have seen that the material characteristics of stainless steel and gold are very different, as shown in diagram 2. Mind you, the display of the curves is not proportional. 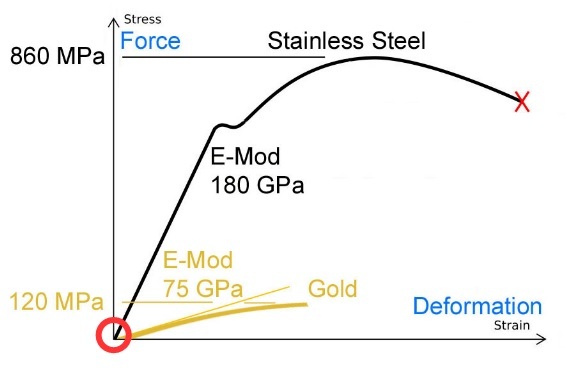 You can see that steel has a nice straight line in the region of elasticity while gold curves and the modulus of elasticity is an approximation, a tangent to the curve. How can a nib made of such two different material perform the same way, have the same characteristics? Firstly, the area in the stress-strain diagram where the nib operates is in the corner, inside the red circle… The red circle is proportionally far too large. More realistically, it would have only the size of a dot. A magnification of what is going on in this dot is shown in diagram 3. It shows that nibs from different materials operate at different levels of pre-stressing. Since the pre-load of the steel nib is lower it will be more responsive to variation of writing pressure. Previously, we talked about material characteristics. Now, we look at nibs of the same design, but different material. Diagram 4 shows inside the green circle the point where the two lines cross. It is the force-deformation-area of operation of the nib. You can see that gold is brought up into this field through a significantly higher pre-load during the setting process. The two materials behave differently in this area. It may look a bit overwhelming; however, I will guide you through. Along the horizontal axis, Deformation, you see the opening of the tines is the same for both nibs. The two vertical dotted lines (depicting the opening of the tines) …… intersect with the gold and stainless steel lines. Projecting the intersect points horizontally – – – ·· – – – ·· – – – to the vertical axis, the Force axis shows, that for the same opening of the tines, the amount of force variation for the gold nib FG is much smaller than for the stainless steel nib FS. We have known this all along, now we know why this is the case. One point: The force, which needs to be applied to the gold nib before its tines widen is higher than for the stainless steel. Often this is compensated by reducing the pre-load or reduce the material thickness, which changes the character of the nib, as we all know now, why. Producing nibs of the same design but different material, which need to operate within the same dimensional constraints, work-hardening (not for gold) and pre-stressing are the variables to move them into this area. If they don’t reach this area, they need to be made to different designs/shapes. Knowing the above takes a lot of guessing out of nib design and leaves more time for designing beauty into the shape. In a following chapter, I will talk about the How-to… for Nibs.